Erin Sanford bought his first S13 in late 2003 after wanting to find something fun to daily drive. The S13 coupe was always visually appealing to him, and so he ended up with a navy blue 1991 manual-equipped example. Within 6 months, the times got to him, and an SR swap was called upon to send Erin down the drifting rabbit hole. Erin spent a lot of time doing the sideways thing, and actually got quite good, as the South East was a relative hotbed of drifting activity in those mid-00s. With many events on the books, Erin decided that he was ready for the cake labeled “EAT ME”, and grew to get really competitive, targeting the regional Drift Fury and NOPI drift series. In the search for more and more reliable power, Erin took the then relatively-unexplored LS1 path. In those days, there was only 1 off-the-shelf swap kit, and very little information about the swap was available. Early on, Sanford learned a hard lesson — the LS1 requires extra oil in the sump to keep it happy during sustained side-loads. But, after recovering from that engine failure, his LS1 set up kept him sideways happily for many years. In 2007, Erin realized a dream of getting to drive a car at full speed on a race track, attending a BMWCCA at Road Atlanta, his local circuit. From there, his Alice-in-Wonderland journey took him down the deeper, darker rabbit hole of chasing the stopwatch and constantly worrying about being late (or slow, as the case may be). 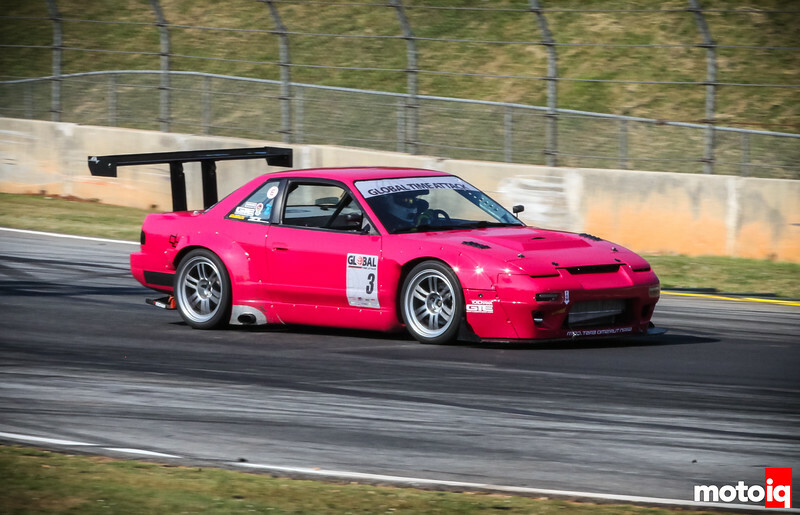 This pink 240SX is actually Sanford’s second S13 chassis. The years of drifting had taken their toll on Erin’s original chassis. It had been wrecked on the left front twice and needed a trip to a frame straightener if it was going to become a competitive track machine. Sanford did the mental math and realized it would be cheaper (at the time) to find another shell and build a whole new chassis. 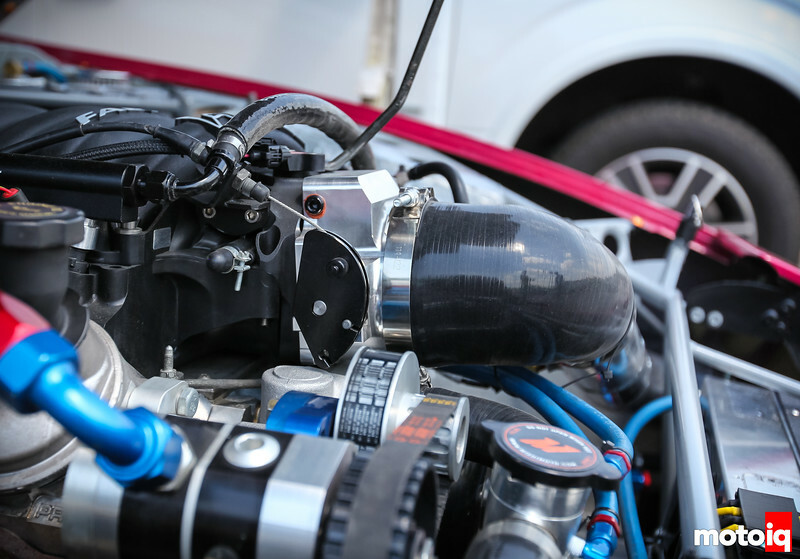 That shell is the vehicle you see here, complete with the updated and upgraded LS1 powerplant. Although the track bug had bit hard, Erin still had a little piece of his heart attached to the drift world. The new shell was stripped down and partially seam welded (only around the strut towers) and caged. As most drift car builders are wont to do, the front end was tubed/tubbed. In retrospect, it also helps with clearance for track tires up front. But, in contrast to most drift car builders, Erin actually did the cage himself. Sanford had purchased a refurbished Lincoln MIG welder way back when and had fabricated much of the original LS swap mounting himself. So he figured he might as well put his life into his own hands and build a cage, too. Nice to see some DefSport parts being used in anger. Cool build. BTW – did you ever get the Astra power steering pump to quiet down? Based on my recent MR2 experience, I think maybe using Redline D4 ATF in it could have been the cause for the loud pump. It seems they like this special thicker hydraulic fluid blend (Pentosin makes one). I found that mounting the pump a little higher in the car helps believe it or not. It’s not all that loud, I couldn’t hear it over all of the other noise the car makes. I just sounds like a small turbine engine on startup then turns into an electric forklift noise after it settles in. 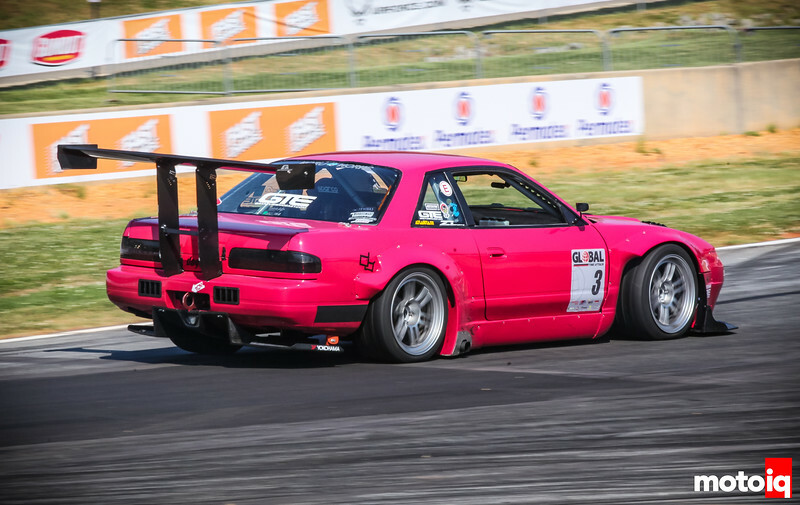 Mike – it’s mounted up about as high as it can be in the trunk of an S13. The SW20 MR2 installation has it down in the frunk just above the steering rack – but it has a big rubber condom over it to help muffle noise. I probably wouldn’t have minded it on the track, but for a sometimes street driven car it seemed annoying to me. Then again, I had a hatch S13 so maybe it was a bit more open. Any chance of seeing how the wastegate flow was prioritized? This is the 2nd recent MotoIQ car-ticle with a similar size turbo and gate. I feel I am running a near identical setup to this particular car though and similarly put extra effort into making wastegate flow entry a relatively shallow angle from my exhaust flow path. Truck manifolds, v banded, near equal length 2.25 inch up pipes, merge into 3″ before tapering down to undivided T4 flange. I have a precision gen 2 7675 CEA .96 a/r with full 3.5″ turbo back exhaust. This is on a 5.3 with ~10:1 compression and timing backed off for tuning, 12* base timing. I’m having trouble with boost creep with a precision turbo 46mm wastegate dumping to atmo. I have a 3psi spring in it and in full throttle 4th gear pulls from 40-100ish it can hold boost steady at 3.5 psi up to 5500rpm, on the way past that to my ‘safe for tuning’ limiter of 6000rpm it loses control and boost spikes to ~8psi, it will likely be even worse with a proper redline. I was contemplating going to a PW66.